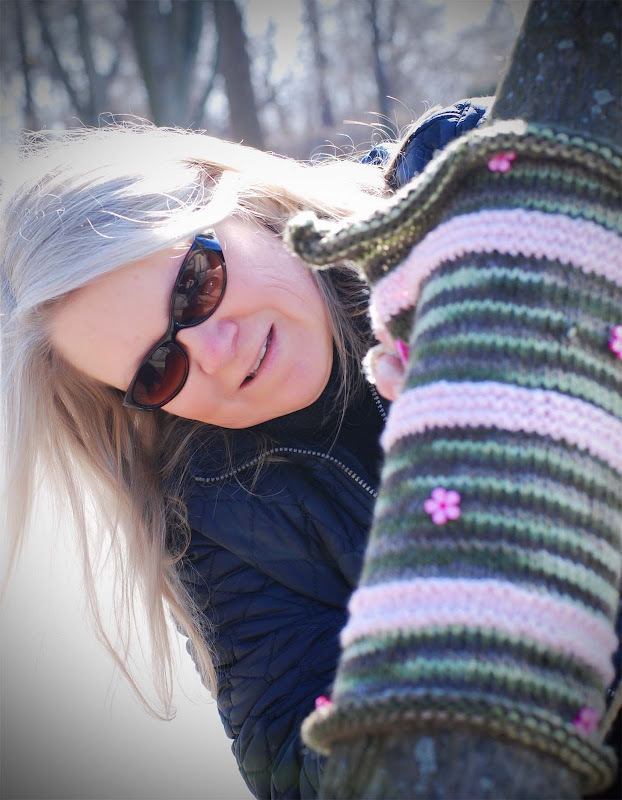 You may have been watching all the colorful fun stuff that happens over here on Denise's blog. I know I have. In fact, it was seeing all of that cool knitting that inspired me to blow the dust off of my own knitting needles. 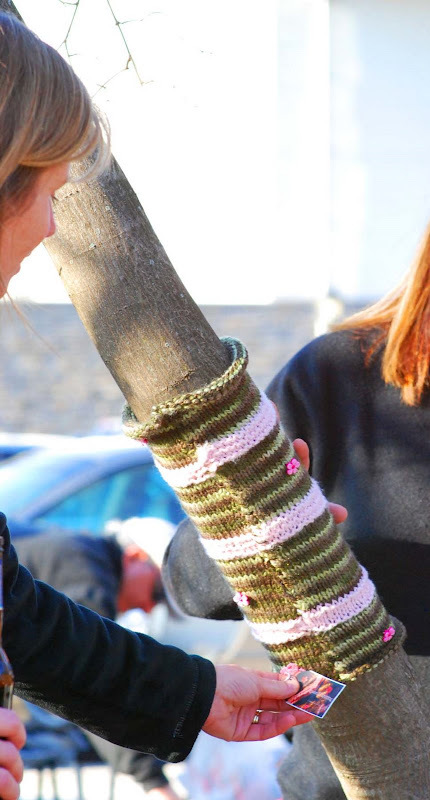 And yes, the first thing I knitted after 25 years of knitting nothing was a sweater for a tree. I made lots of mistakes. One of them is evident in this photo. But, the tree didn't seem to mind. I finished my knit-up several days ago, but I wasn't sure where to put it. 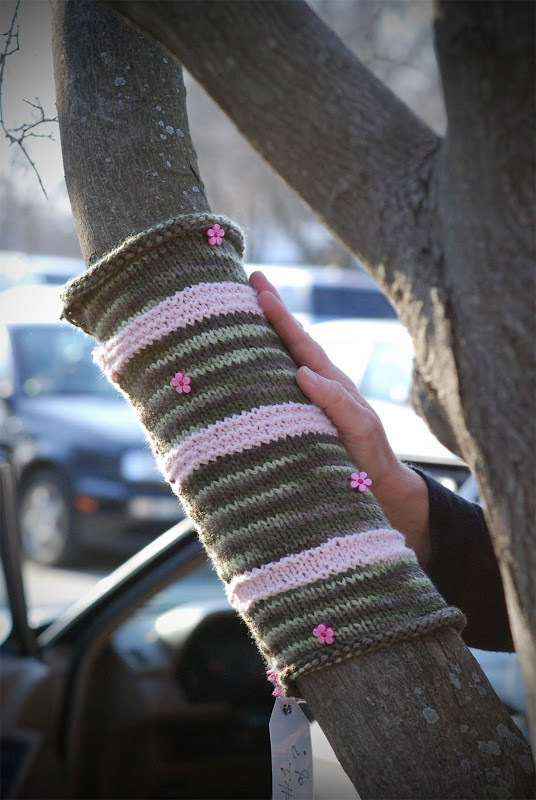 I was worried that store owners on main street might not want a sweater for the trees in front of their businesses. I was afraid that my knitting might be removed immediately. In fact, I was afraid that the local authorities might catch me in the act, and ask me to remove it before I got it up. And then, I learned that a friend was having a tailgate party at her son's college basketball game. His last home basketball game, as he is a senior. 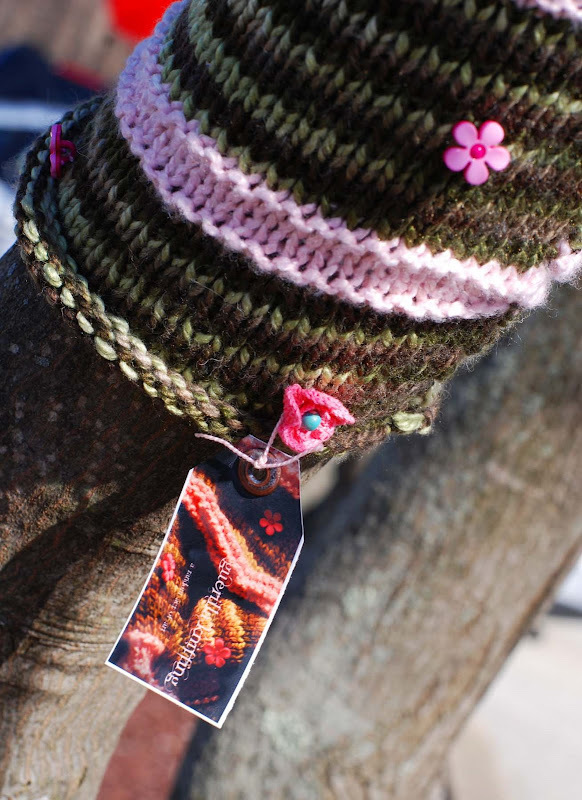 How fun to leave a knit-up on one of the trees where they had celebrated Ben's basketball games for four years. I arrived early to choose the tree and apply it's sweater. I was able to watch as folks arrived for the tailgate and noticed my knit-up. I heard one man comment that it was "the ultimate in tree-hugging." Everyone wanted to touch it. Everyone seemed to get a kick out of it. 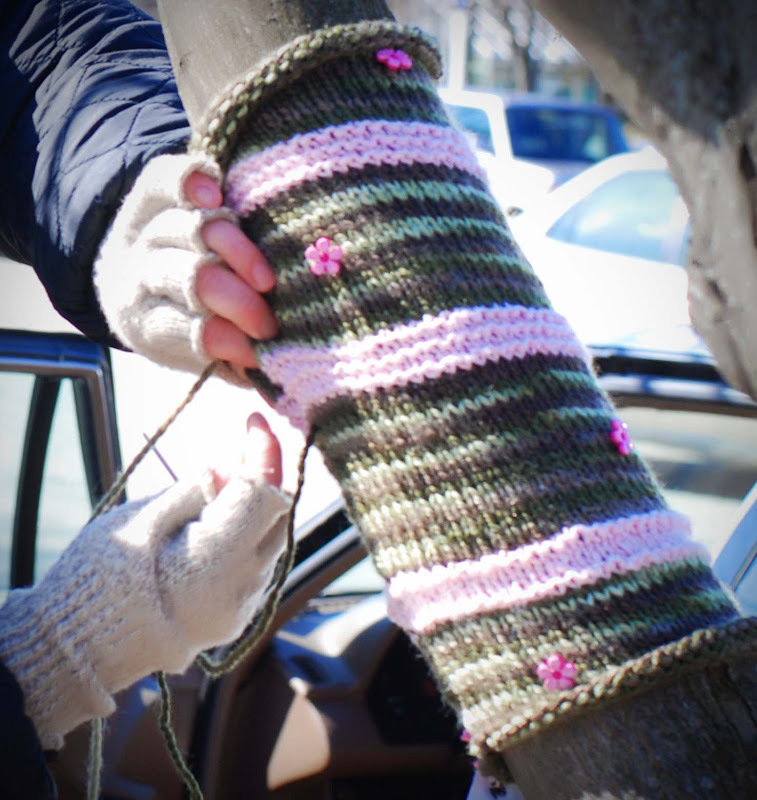 Being able to watch from a distance as folks experienced my tree's sweater has inspired me to knit again. 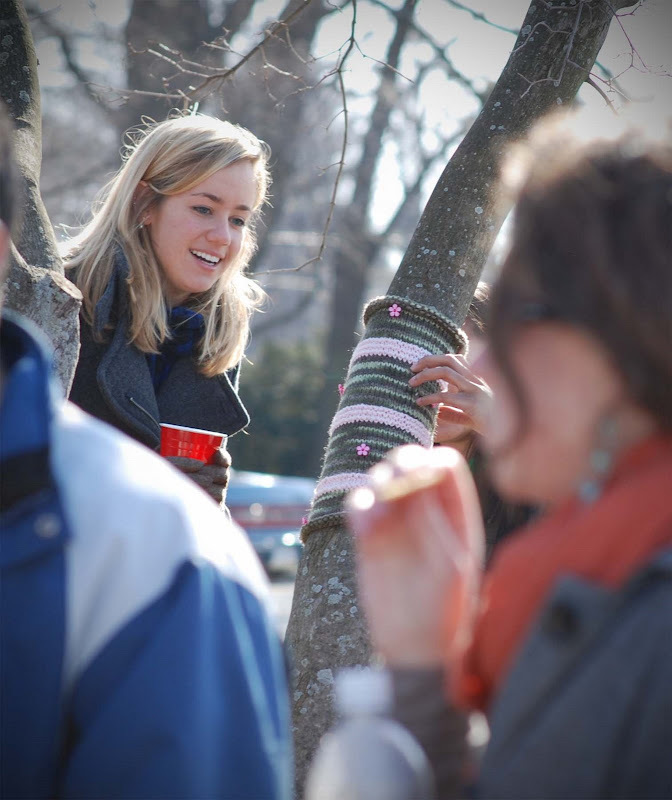 To knit more sweaters for cold, eastern U.S. trees. I think this tree is standing a little taller tonight, a little prouder. 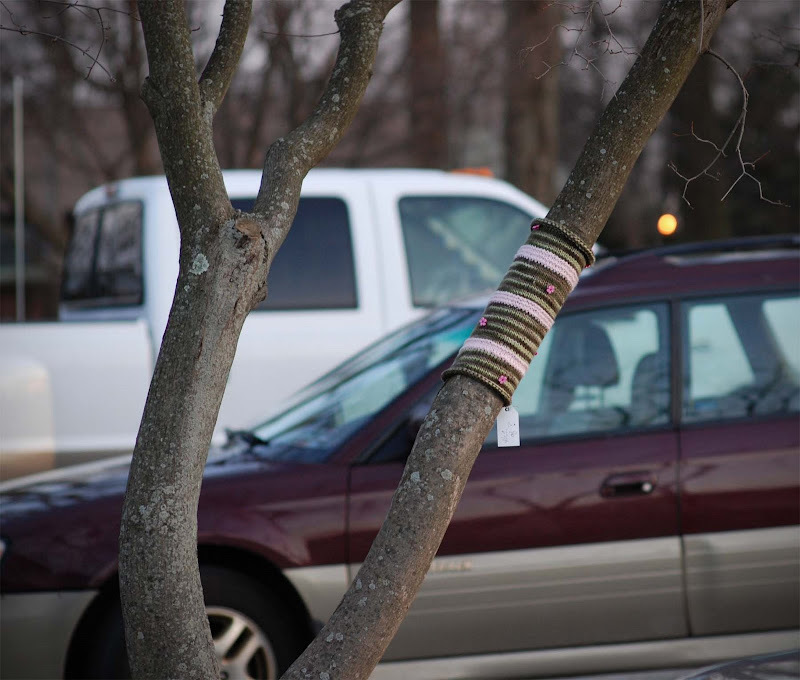 After all, she is the the only tree with a sweater on the entire campus. Great job Leslie. I think you picked the perfect tree in the perfect place. And so cool that you could stand around and see peopel's reactions. In NYC, people pretty much passed the tree I worked on without even glancing!! I love it...and I love how you photographed the public interacting with it! This is so great Leslie! I too think it's nice that you could watch unnoticed as others happened upon this. I love the look in their eyes as they take his all in, the way they caress the tree, and enjoy the whole experience. How lovely to see the shots of everytone playing with it too. It will definitly make the other trees jealous..
Leslie - you are such a wonderful blogger -I love what you did, how you photographed it - awesome. leslie, you guerilla grrrrrls are GRRRRREAT! 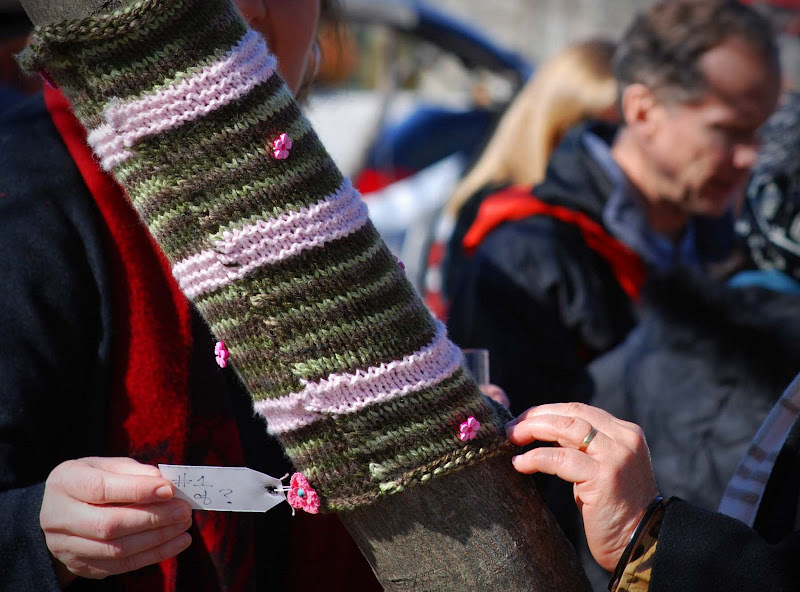 I LOVE seeing all the crazy knitting like graffiti going up....I'm going to pay attention to your next guerilla goings on...do more! how wonderful to capture all the interactions!!! This is great Leslie!!! 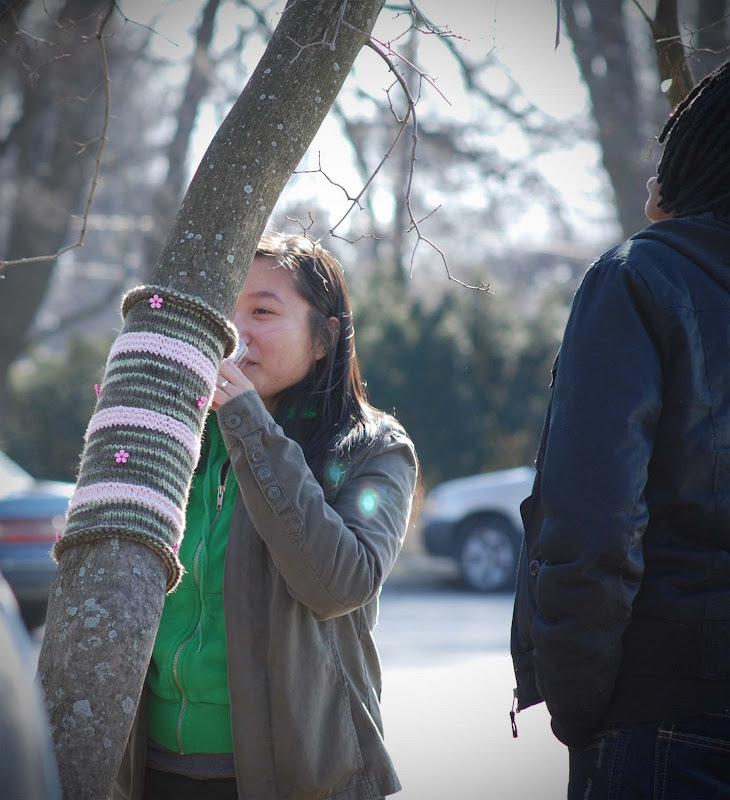 What a fantastic idea to bring awareness to our beautiful sister trees, spread some love around, and create unity. I wish I had know about the Guerilla Knitting even ahead of time, I would have knitted something for the trees by the creek near my house...those the Beaver troops keep bringing down. Love this idea! 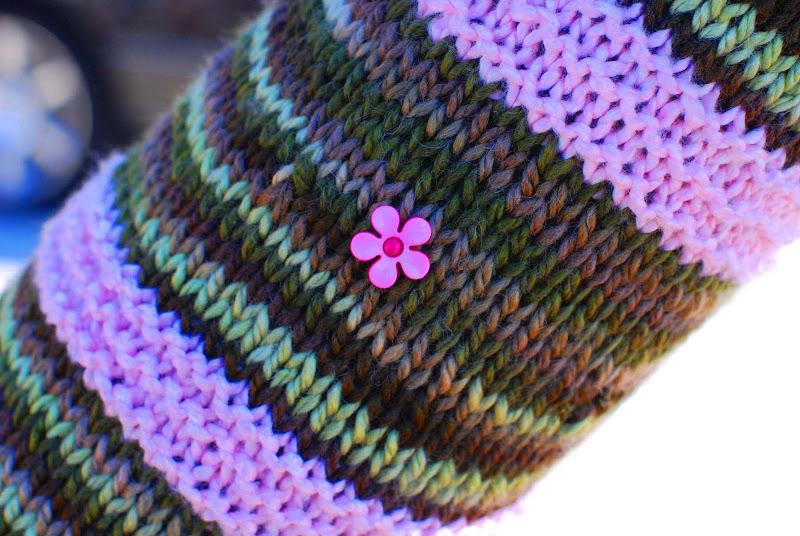 I love the addition of the little pink flowers :) Beautiful knitting. Look at all of the love that tree is getting!!! what a lucky tree!!! It's official--you must now travel and spread the LOVE!!!! This is so amazingly stupendous I can't even comment! Okay, I will. These are lovely photos. Thanks so much for sharing all this! I am inspired to go back and stand by one of mine and see what they say! I wonder if they are still there? Mistakes? What are you talking about? This is GORGEOUS! sorry it's taken so long to catch up, but I'm glad I am. I think it could be a childrens book that a certain adorable grandchild might like to read. you should really make some legwarmers for yourself! as easy as a tree cozy fer sure! How fun was this??? Loved the delicate flowers on the knitted piece! Love it! So glad you found the perfect tree. I agree with Karen, this would make a great story for your grandchildren. this amazing project has inspired me to learn to knit...AGAIN! Ya treehugger! Man, I want you to knit me a sweater - it's so pretty! You always do such an incredible job with your artwork and photography, Leslie.